Prime Minister Narendra Modi and US President Barack Obama are scheduled to meet at the White House on Tuesday for over two hours that will include a working lunch to be attended by Vice President Joe Biden. The seventh Modi-Obama meeting will highlight the deepening of the Indo-US relationship in key areas since the President's visit to New Delhi in January 2015, the White House said. "This is a pretty significant amount of time for the President and Prime Minister. They would be able to cover every single issue in the time allotted," a senior US official said,adding that the actual time has been expanded to provide ample opportunity to cover all issues. "The President looks forward to discussing progress made on our climate change and clean energy partnership, security and defence cooperation, and economic growth priorities," the White House said, adding that Biden would will also attend. After an hour-long meeting, the two leaders are briefly scheduled to address the press inside the Oval Office for about 15 minutes. 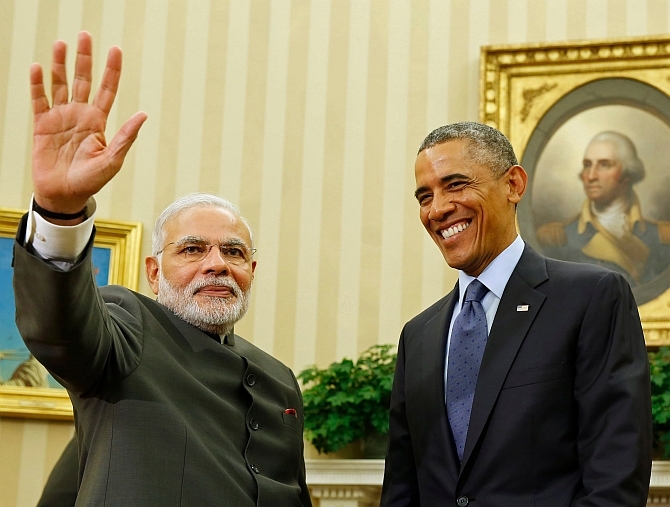 Soon thereafter Obama would host Modi for a working lunch in the Cabinet Room of the White House. Biden would also be present for the lunch. "They have two pretty lengthy meetings. One would be in the Oval Office. Then there is a little bit of a press spray. Then they would shift to a lunch meeting as well. It is pretty significant," the official said. Modi is currently on a three-day US visit. On Wednesday, he would address a joint meeting of the US Congress. Watch out for the speed of India-US defence ties!